Blowing out the candles is easy compared to feeding a 400kg saltwater crocodile. CROUCHED by the water's edge, Robert Irwin dangled the bait in front of a massive saltwater croc, encouraging him to come closer. As the crowd gasped, he took a step back, bait still in hand, and waited. "Robert, I think you remind him of somebody," mum Terri said from the sideline. And she didn't need to explain. Dressed in his signature khaki, the 10-year-old was the spitting image of his late father, Steve Irwin. 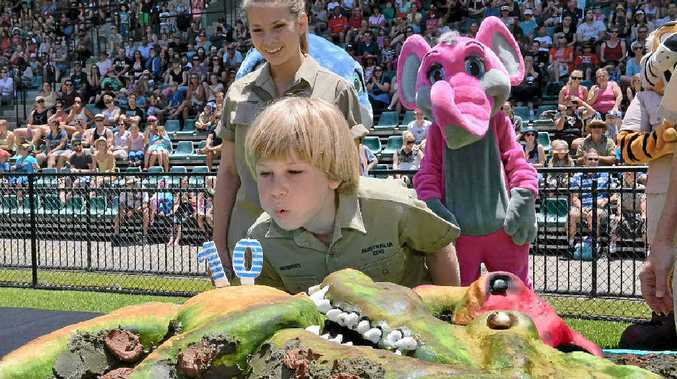 Ten years after the Crocodile Hunter made world news for carrying a baby Robert while he fed a croc, the youngster celebrated his 10th birthday by feeding his first "saltie" in the Crocoseum. "I think it's really cool to feed my first saltwater croc because I will be able to carry on in dad's legacy," he said. Having previously fed alligators and freshwater crocodiles, Robert was quick to point out their saltwater counterparts were a whole new challenge. "Saltwater crocodiles can get really big . . . around 15-16 feet, and the freshies grow only to about 10 feet," he said. "There's a big difference between the freshies and the salties, so I'm really excited to be able to feed a saltie." 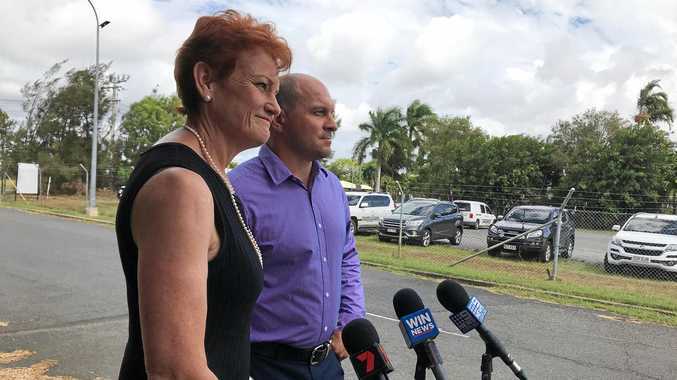 "Today is the first time since he was two that I won't hear, 'When will I be able to feed a saltwater crocodile?,' " a proud Terri laughed. "It has only been eight years of daily begging, so I'm really looking forward to it. It's so exciting for him." Robert followed in the footsteps of not just his father, but big sister Bindi who also fed her first saltie when she was 10 years old. "I look at Robert and he's so much like dad," Bindi said. With the help of Australia Zoo director Wes Mannion, Robert fed Monty - a 3.7m saltie more than 400kg. During the show, Terri explained why Monty was the perfect choice for Robert's first saltie experience. "Monty has been at Australia Zoo for longer than any other crocodile, he actually grew up with Steve," she said. To cap off the "best birthday ever", Robert was surprised with the unveiling of a new dinosaur sculpture. Situated outside the freshwater crocodile enclosure, the display was created especially for Robert and shows a Deinosuchus taking a bite out of a Parasaurolophus.